Are you looking for kindergarten resources? I am in the process of homeschooling my second kindergartner, and there's nothing more fun (and amazing) than watching a young child learn. I used LeapFrog Fridge Phonics magnets to help my daughter learn her letters and their sounds, and practice spelling her name. We also use these magnets to teach reading by placing individual letters on the refrigerator, saying their sounds, and learning to blend as we slide the letters together to form words. We usually start with two letters, then move to three-letter words that I know my daughter will encounter in Bob books. While these magnets are perfect for kindergartners, my older son also likes to use them to practice spelling and my toddler loves playing with them while I cook or teach my older children. These magnets are easy for little hands to grasp, and are strong enough to easily stick to the refrigerator. As an added bonus, they come with a base that sings the alphabet song and makes letter sounds. 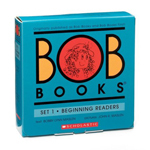 Bob Books are my favorite first readers for kindergartners. These books come with hand-drawn, humorous illustrations, along with simple text that won't intimidate beginning readers. This inexpensive set of 12 books allows children to quickly progress from playing with flashcards and fridge magnets to reading real books! These books are extremely popular with home educators and are recommended in the E. D. Hirsch, Jr.'s book, What Your Kindergartner Should Know. Kumon's My First Book Of Tracing is a great handwriting practice for reluctant writers. We used this book, along with Kumon's My First Book Of Mazes and My First Book Of Cutting to help my oldest build fine motor control, hand/eye coordination and the confidence he needed to develop neat handwriting. These books are a fun, engaging, inexpensive way to ease your children into writing. Kumon also sells alphabet and number workbooks that are a great way to homeschool preschoolers who want to "do school" alongside their older siblings. 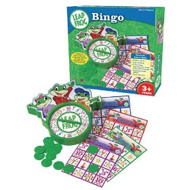 Leap Frog Bingo is a fun way to help your children practice number, shapes, colors, simple addition and letter sounds. This game contains durable, oversized bingo tiles and sturdy cards that are perfect for little hands. 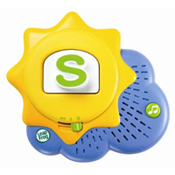 My children love taking turns choosing which version of bingo we will play and spinning the interchangeable spinner. This kindergarten resource allows you to drill concepts and test your child's knowledge without resorting to worksheets and flash cards. Your children will have so much fun, they won't even realize they're learning! Teddy Bear Counters are one of my favorite kindergarten math resources. We sort these bears by color, use them to practice counting, place them in line to learn ordinal numbers and mix them up to make patterns. When our math lesson is over, I don't dare put the bears away. The funnest part of playing with these teddy bear counters is using them for pretend play! What Your Kindergartner Needs to Know: Preparing Your Child for a Lifetime of Learning is part of E. D. Hirsch, Jr.'s Core knowledge Series. This book contains teaching tips, stories, activities and suggested resources. When paired with a phonics and math program, this book becomes a complete curriculum. 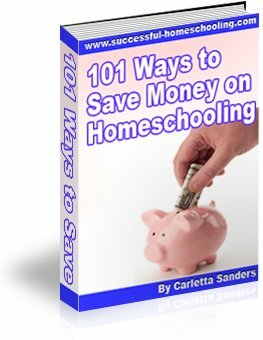 If you are uneasy about homeschooling kindergarten, this book will help you make sure your child stays on par with his or her peers. 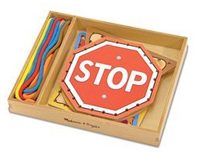 Melissa and Doug's Pattern Blocks and Boards are great for teaching shapes, colors, patterns and sorting. 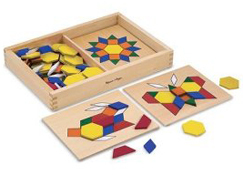 This set of wooden blocks also comes with 10 boards that prompt your children to make pictures and designs by placing the shapes on the boards. My children often ask me to pull out their blocks so they can spend hours making designs of their own. Playing with Play-Doh is a weekly activity at our house. It not only boosts creativity and prompts imaginative play, it is a wonderful way to help children develop the fine motor skills that are necessary for writing. We love pounding the play-doh flat so we can etch it with toothpicks or cut it with plastic knives, scissors and cookie-cutters. We also roll the play-doh into balls and snakes, and use them to form numbers and letters. Play-doh is an inexpensive, entertaining, learning activity for all ages. When you have toddlers in the house, the best thing about play-doh is - it's non toxic! I love purchasing products that can be used for multiple purposes, so these Lace and Trace Shapes are one of my favorite kindergarten resources. Lacing activities promote fine motor development and hand eye coordination. In addition, these lacing cards can also be used to practice tracing and identifying shapes and colors. Melissa and Doug's Lace and Trace Shapes come in set that contains five cards and matching lacing strings in a wooden box for easy storage. Student Clocks are great kindergarten resources for teaching your children to tell time and count by fives. This clock comes with different colored, moveable hands that will help your child differentiate between minutes and hours. When our lessons are done, my daughter loves using her clock to quiz her mom. You can save money and support this website by purchasing your kindergarten resources from Amazon! Follow this link for additional information about Homeschooling Kindergarten.